I’m going to be honest – I was not looking foward to reading this book. The simple fact is that, at a glance, it has little unique to offer. The back cover essentially claims it to be a collection of short stories about pirates – and that’s about it. But therein lies the tragedy, as many folks – shortsighted individuals such as myself – might grab this book from the shelf, half-heartedly read the description, and then put it back with a ho-hum attitude. And that would be a shame, as this book is nothing short of brilliant. Tales of the Atlantic Pirates is composed of 13 short stories, ranging from 1671 right up through 2006. Each is historically inspired, sometimes borrowing historical events and figures, other times injecting a small dose of folklore-based supernatural. And each story concludes with a brief paragraph or two that explains the historical (or folk-lore) inspirations that led to the creation of said story. Gee, my own description sounds pretty dry as well. But perhaps that’s because this book’s primary virtue is one that’s not so easy to convey. In short – the writing is simply outstanding. I’m not talking about the spelling and grammar; what I mean is that Tales of the Atlantic Pirates is an absolute page turner. Each story is full of characters and situations that are fascinating and ring true. The tales feel like excerpts to much larger, grander stories, and yet not once in reading it did I feel the need to scramble to get my bearings. Whether reading about zombie pirates from Haiti, the girl who stows away to serve with her pirate captain father, or the young SeaScouts searching for pirate treasure, each story was grippingly entertaining, while also being surprisingly educational to the genuine historical accounts that inspired them. 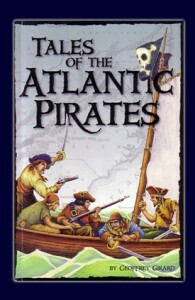 Throughout, Tales of the Atlantic Pirates is an intriguing and effortless read. Author Geoffrey Girard did a smashing job, and I could continue to blubber on – from his incredible cleverness at inserting 1920’s mobsters so seamlessly in to a collection of pirate tales, to his novel way of envisioning Captain Blackbeard and Lieutenant Maynard’s final battle. But really, I hate to embarrass everyone. Suffice to say, this is a fantastic read for any age, and you really, truly should check it out for yourself. This entry was posted in Books and tagged bilgemunky's favorites, girard, history, non-fiction by Bilgemunky. Bookmark the permalink.